We've moved!!! Come visit us in our new location in Uptown Sedona, 150 Highway 179 Suites 2 & 3. 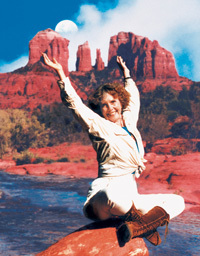 Our Vortex Tours help you reconnect with the Sacred Land of Sedona with a personal vortex experience unique to everyone. Learn how the Medicine Wheel represents the cycles of life. Walk the Medicine Wheel to receive inspiration and learn how to make your own anywhere. Simple yet profound. Further discover yourself on our Sacred Earth Journey ... for adept and novice alike. In Sedona we have the gift of 15 to 20 vortexes within a five-to-ten mile radius. Nowhere in the world is there such a concentration of power, beauty and grandeur. Sedona is the place where artists, shamans, visionaries and spiritual sages have come for eons of time to inspire and be inspired. I invite you to be clear on your intentions while visiting these red rock wonders and allow the magic to transform you into your next steps on your spiritual path. "Our intention is to provide the means for you to connect with your Higher Self or Source, so that you can access this knowing at will on a daily basis. It is with this intention that all our tours, retreats and programs align."